Hi. Ilaria here. It was freakish energetic excitement that helped us get out of bed at a goddam awful time in the morning to catch a cheap flight to Barcelona. But it was all worth it once we touched down about 10am, Spain-time. This city boasts a curiously beautiful balance of 21st century inevitability and the past; intoxicated souls roam the labyrinths of century old pavements, dancing between the shadows of the Gothic Quarter and the sparkle of Barceloneta beach. This city reminds you the past can be just yesterday if you want, while the future waits for tomorrow ­– Barcelona is about the now, exploring the moment before you. And with that, we dropped our bags at the hotel and headed straight to Las Ramblas and the Mercat de La Boqueria, the most amazing market in town. 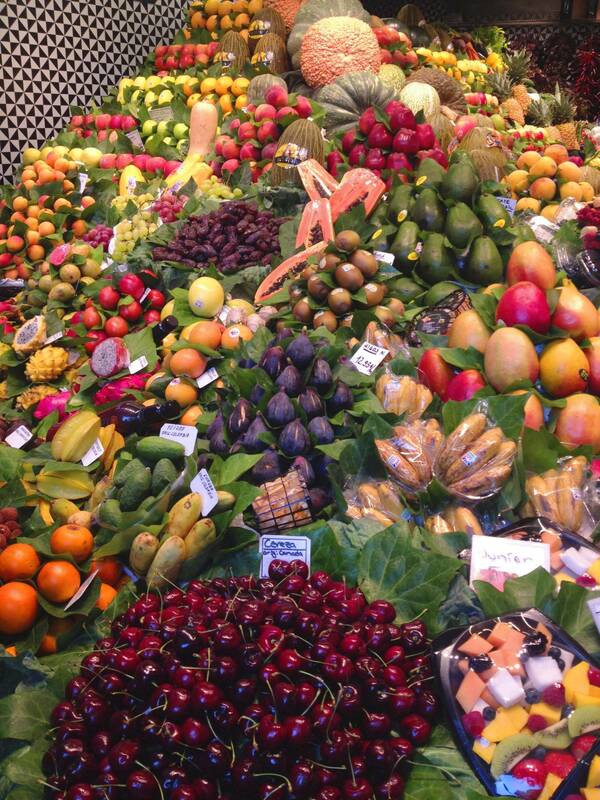 Figs, cherries, prickly pears, you name it, La Boqueria has it. 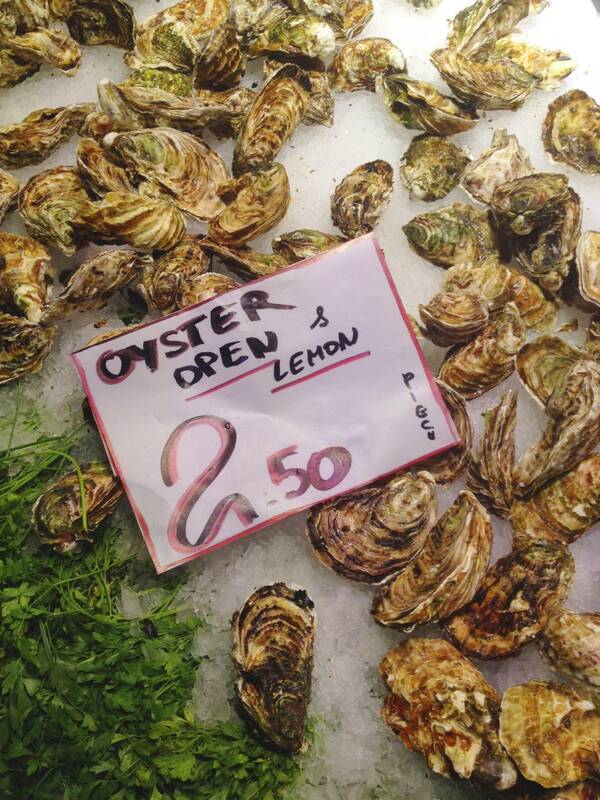 Along with these oysters there was some of the freshest fish from the Mediterranean, all lined up on a bed of ice. This place is a visual feast in itself. Without tasting a single thing, the sweet smells of serrano ham, the colourful sights of exotic fruits, and the clatter and chatter of plates and people is inspiring enough. 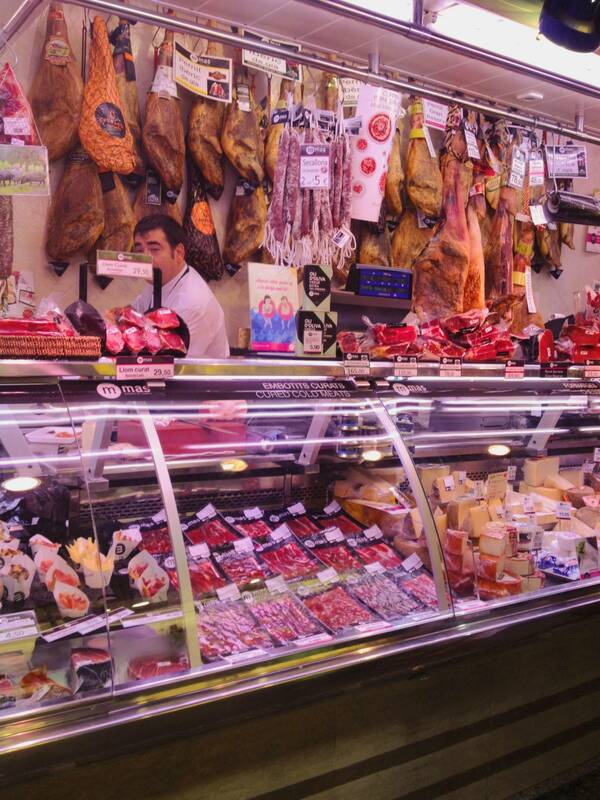 However, the tapas bars through La Boqueria’s big iron gates are hard to go by. 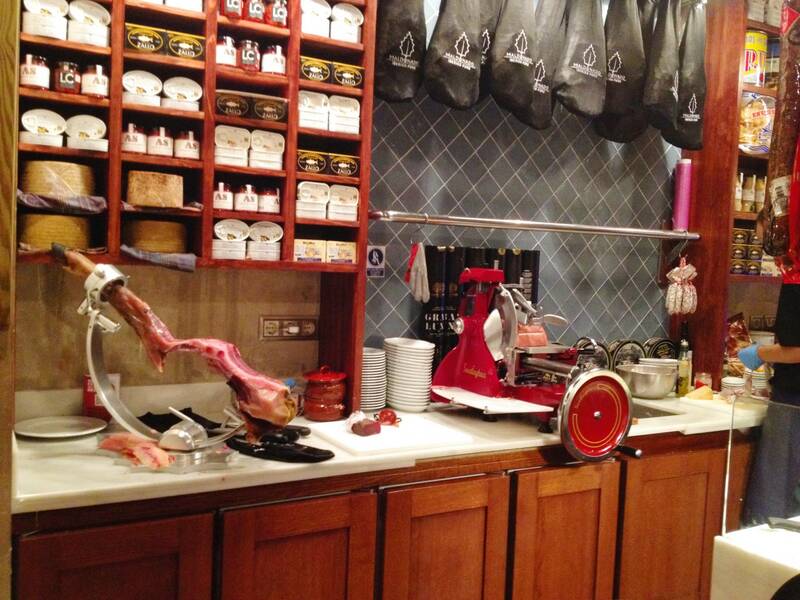 Spain isn’t Spain without her jamón! 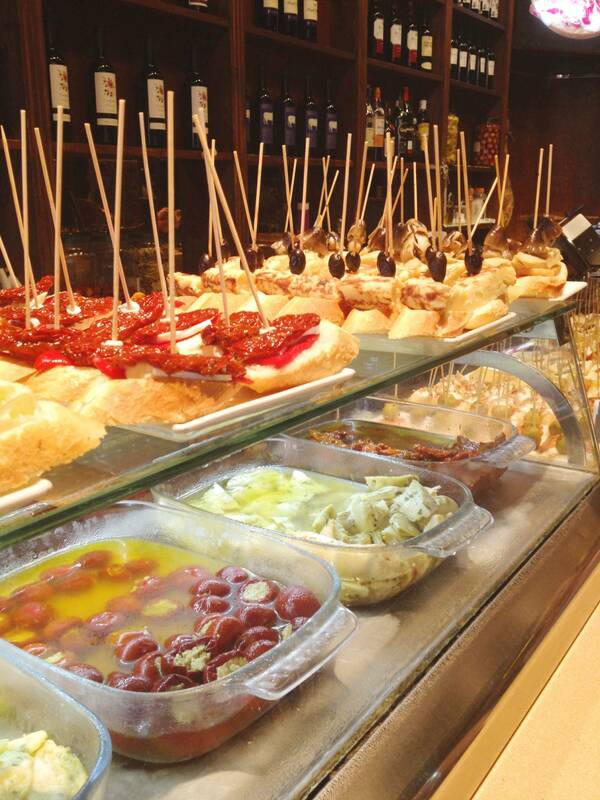 An example of the tapas displayed atop a tapas bar cabinet. 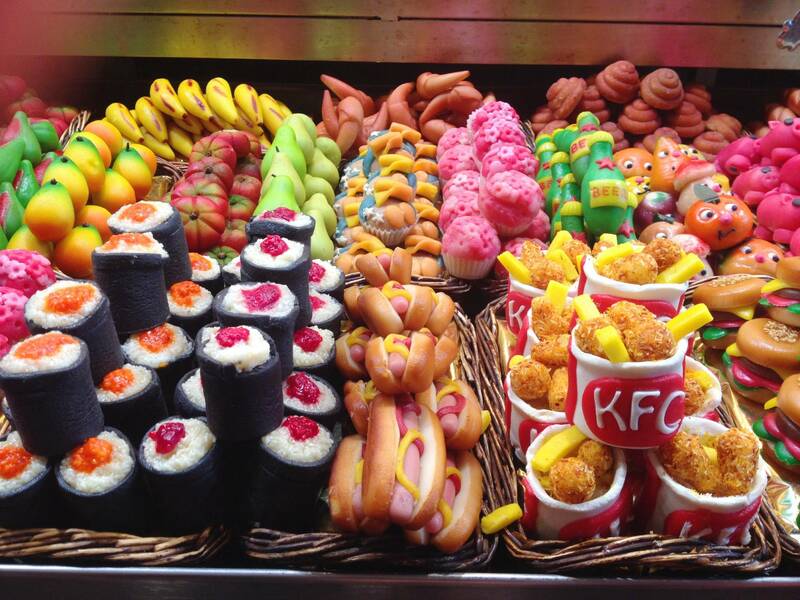 Pick what you want, and pay the relative amount after the discarded toothpicks left on your plate are counted. We nibbled non-stop for a couple of hours (it’s so easy to do! ), one tapa at a time. Charred padron peppers with generous slices of fried chorizo skewered onto pieces of baguette was the standout morsel of the day. Many more bites of potato tortilla and croquetas, both atop slices of baguette (who can refuse a double starch combo!?! Hehe …), were washed down with sneaky cañas (smaller sized beers) and cheeky Rioja sips. 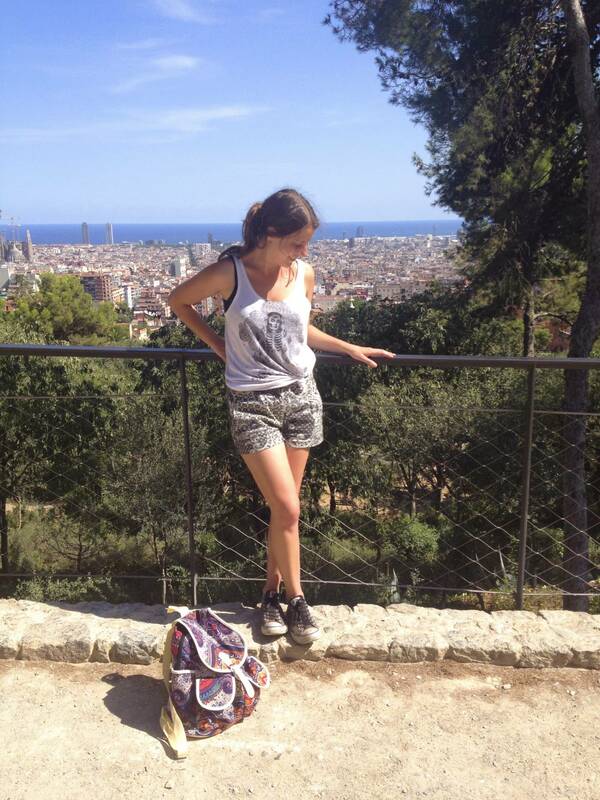 Feeling significantly heavier than when we arrived, we plodded up the hills to the top of Park Güell, a Gaudi haven with a beautiful outlook over the city. With the sun on our shoulders we effortlessly watched tiny people hurriedly scurry between streets, moving on through an endless afternoon. Soaking up the city views. Hi Julie, hope you’re keeping well. I love reading the news from both you and Ilaria. 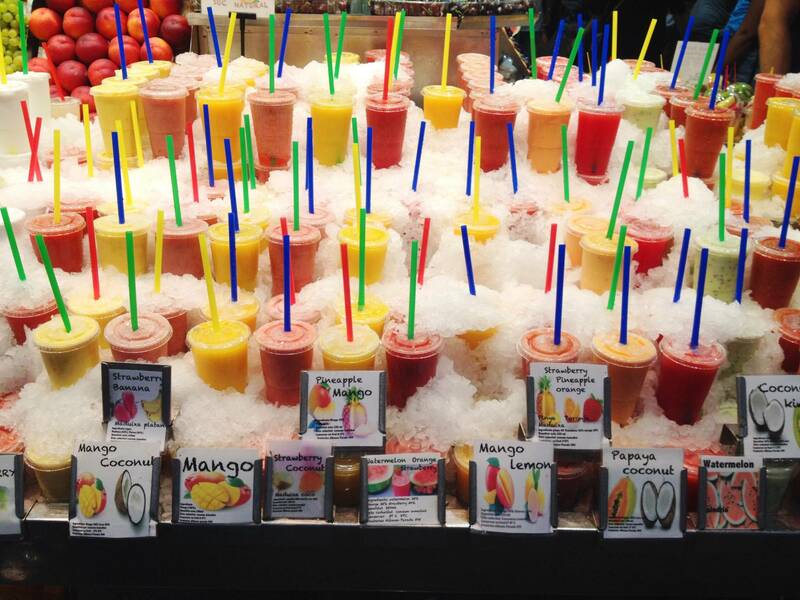 As we visited Barcelona in July, Ilaria’s blog is a special hit this month , especially as I spotted a very similar photo to one that I took at the Mercat de La Boqueria. See my photo and you’ll see the wall has the same tiles , I shot from a different angle and looking at the sign on the wall you’ll see why ! Fried potatoes, smoked fish, herbs and flowing egg yolks equals a certain kind of deliciousness that you might think is the domain of Sunday cafés offering brunch. Nah! It's so easy to make at home.